Has Republican Ed Whitfield unethically supported the interests of his wife’s firm? LaserLock Technologies, a firm that sells anti-counterfeiting products, won a powerful congressional ally on Capitol Hill after recruiting a Kentucky congressman’s wife. 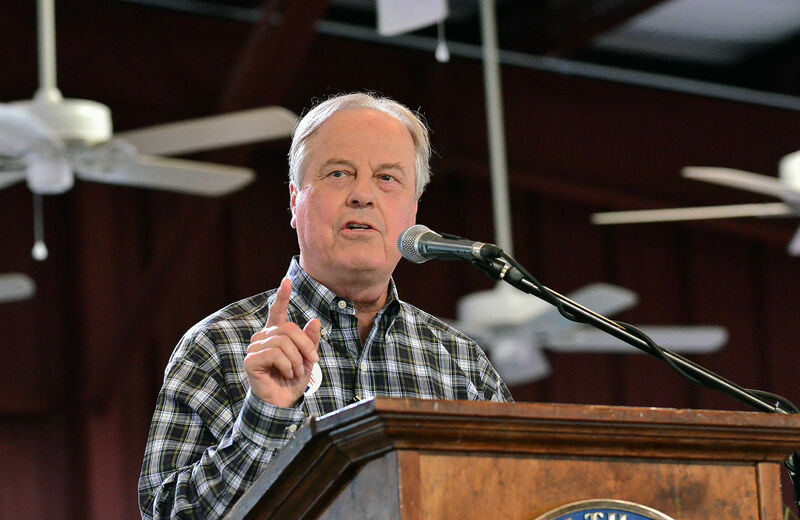 Representative Ed Whitfield, a senior Republican lawmaker from western Kentucky, personally submitted company documents on behalf of LaserLock to the congressional record in support of legislation crucial to the firm’s business. Whitfield’s wife, Constance Harriman, a registered lobbyist, has come under scrutiny from Office of Congressional Ethics investigators for unduly influencing Whitfield and his staff for her client, the Humane Society. But new revelations about her role with LaserLock, a company in which she is an investor and where she serves as a board member, reveal that Representative Whitfield may have used his congressional office to boost the fortunes of his wife’s company. Whitfield’s effort to assist LaserLock is captured on video. A tape of a subcommittee hearing on the morning of April 25, 2013, shows the congressman intervening to endorse LaserLock-backed legislation to create a national standard for tracking the distribution of pharmaceuticals. Five months prior to Whitfield’s advocacy on behalf of the firm, in November of 2012, LaserLock appointed Constance Harriman, Whitfield’s wife, to its board of directors. The April 25 tape shows that as the Energy and Commerce Committee began discussing HR 1919, the Safeguarding America’s Pharmaceuticals Act, Whitfield told colleagues that his interest was sparked by the threat of organized crime. Whitfield then moved to submit a “statement from a company called LaserLock.” The statement, from LaserLock Chief Executive Neal Alpert, enthusiastically endorsed a digital tracking system for drug products to combat fraud. LaserLock sells SecureLight+, a labeling product the firm has pitched as a solution for pharmaceutical firms seeking to thwart counterfeiters. Whitfield’s move to intervene on behalf of the company was a considerable endorsement. Whitfield is a senior member of the Energy and Commerce Committee, which oversaw the markup of the counterfeiting legislation. The congressman did not disclose his family’s investments in the company or his wife’s position as a board member during the hearing. Whitfield also did not disclose that the Georgetown University forum he referenced during his remarks was sponsored by LaserLock. Pictures from the event show Whitfield chatting with LaserLock executives and advisers, including Alpert and a company advisor named Brad Blakeman, a well-known DC lobbyist. The counterfeiting legislation requires the Food and Drug Administration to implement a system for manufacturers, pharmacies and other distributors along America’s pharmaceutical supply chain to establish tracing and identification standards to track drug products. LaserLock heaped praise upon the tracking system outlined by the legislation. “LaserLock is uniquely positioned to play a leadership role in designing such a system,” said Michael Sonnenreich, chairman of LaserLock’s board, in a prepared statement. “In passing this legislation, the House of Representatives has taken a strong first step in addressing the dangers that counterfeit pharmaceuticals pose to our nation,” Alpert said in a celebratory press release. The bill backed by LaserLock later passed the committee and sailed through the House of Representatives on a voice vote, meaning a roll call of votes was not taken. The legislation merged with a Senate version of the bill and was signed into law by President Obama last year. Upon her appointment to LaserLock’s board in 2012, Harriman was granted stock options valued at approximately $89,568, according to statements filed with the Securities and Exchange Commission. She was also granted the option to purchase 1 million shares of the company’s common stock at a discount price of $0.05, along with an additional 1 million shares at the same price that would vest upon completion of two years of service on the board. The Whitfield household continued to hold a significant stake in the company as the congressman submitted testimony on behalf of LaserLock’s CEO. Whitfield’s personal-finance statement shows the couple owned up to $100,000 worth of stock in LaserLock through 2013. Though the firm may not be well known, LaserLock’s roster of advisers and board members reads like a who’s who of Beltway politicos. Former Republican National Committee Chairman Michael Steele serves as an advisor to the firm, and previous board members include former World Bank President Paul Wolfowitz and former Secretary of Homeland Security Michael Chertoff. LaserLock’s Alpert also has a history of notoriety. In 2007, Alpert was ordered by the District of Columbia to “repay nearly $70,000 in unauthorized expenses and unaccounted money from a pair of local baseball groups he had chaired,” according to a story in Politics Daily. He was accused of using the baseball charity’s money on to pay for food, drinks and charges at DC nightclubs. In 2011, The New York Times reported that Alpert was a member of a group of political consultants who attempted to land a $10 million contract with Muammar el-Qaddafi to help the Libyan strongman maintain power. The investigation narrowly focused on Harriman’s work on behalf of the Humane Society, and did not involve her affiliation with LaserLock. The investigation also did not involve a separate ethics issue, reported in July by the Kentucky Center for Investigative Reporting’s R.G. Dunlop, involving an investment property owned jointly by Harriman, Whitfield and a prominent lobbyist named Juanita Duggan. The probe, however, inadvertently exposed e-mails showing further evidence of LaserLock’s influence through the Whitfield household. As part of the probe, the Ethics Committee released pages of e-mails between Harriman and Whitfield’s staff. The e-mails show that in addition to e-mailing Whitfield’s staff about Humane Society issues, Harriman used Whitfield’s staff to gather information on legislative developments on behalf of LaserLock. On April 13 of 2013, LaserLock’s Alpert e-mailed Harriman to ask about a customs bill sponsored by Representative Kevin Brady. Harriman, forwarding Alpert’s e-mail, queried Whitfield’s chief of staff Cory Hicks about the legislation. “Do you think Ed will be supporting this bill?” she asked. The next day, Whitfield appeared at a LaserLock promotional event at Georgetown University. Harriman and Whitfield’s office did not respond to a request for comment from Republic Report.